Residents of Tindharia under the banner of People’s Welfare Society (PWS) on Monday threatened to start an agitation to demand immediate restoration of a major stretch of road on National Highway 55 that was destroyed by landslides in 2011. Fed up with the delay in restoration of the vital road in the hills, a seven member delegation of the society also called on Bengal Governor Keshari Nath Tripathi at Raj Bhawan in Darjeeling during the day and submitted a memorandum seeking his intervention in this matter. After the meeting, in a Press conference at the Darjeeling Press Guild, PWS president Hari Prasad Chhetri said, “We are talking about a national highway which has not been repaired even after four years. Nowhere such a thing takes place. We requested the Bengal Governor to use his influence to persuade the state government and the Centre to repair the highway at the earliest”. The PWS memorandum states that a portion of 120 meters of road below the workshop of the Darjeeling Himalayan Railway (DHR) in Tindharia under Kurseong sub-division was swept away by landslides on September 28 after the deadly September 18, 2011, earthquake. “The NH 55 is our lifeline. 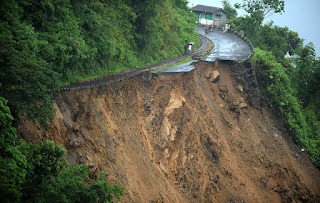 The landslide has disconnected the highway between Siliguri and Darjeeling which is causing problems to the public of not only Tindharia but surrounding areas such as Giddeypahar, Mahanadi, Ghayabari, Chunbhatti and Rongtong with population over 50,000,” Chhetri said. The PWS submission to the Bengal Governor highlights the residents of the hills incurring huge expenses in purchasing essential commodities of daily use including hardware materials because of the trucks and buses taking the alternative Rohini route, instead of the highway. Chhetri, the PWS general secretary. various newspapers but the actual ground work has not been done yet. Now we have decided that it will be ‘no road no vote’ till our demand is fulfilled,” said the PWS general secretary. The Gorkhaland Territorial Administration (GTA) has already taken up the issue with the Centre. A GJM delegation in August met Nitin Gadkari, the union minister for road and transport and submitted a detailed project report along with relevant photographs. The memorandum to the Governor also points to the great concern which may cost human lives and damage to properties. “In case of fire havoc taking place in the area, the fire engines cannot reach the affected place. Similarly, in the event of any natural calamities no relief measures can be provided to the victims,” reads the memorandum.